VITAL was decommissioned in 2013. The platforms used to run VITAL became untenable to support and the software was turned off in July 2013. These pages sought to provide information for project which was funded by an five-year grant from the NSF in 2003. Many of the features in VITAL have been ported to a new project called Mediathread. See more info here: http://mediathread.info. 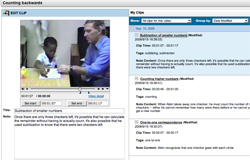 The National Science Foundation suppored the Columbia Center for New Media Teaching and Learning (CCNMTL) and Herbert Ginsburg, Jacob H. Schiff Foundations Professor of Psychology and Education at Teachers College, with a grant to continue development of Video Interactions for Teaching and Learning (VITAL), a learning environment for early childhood mathematics educators. This web-based application was first used in Professor Ginsburg's Development of Mathematical Thinking course at Teachers College in 2003. The VITAL: Early Childhood Mathematics Education project seeks to develop a learning environment that consists of a curriculum for early childhood mathematics education, a digital library, and videos, contained within an online community workspace. conduct an evaluation of learning outcomes. By the end of the grant period, May 2009, the resource will be ready for distribution to teacher-education programs nationwide. "This is an exciting and groundbreaking new program that will revolutionize the way children are taught mathematics," notes James Neal, Vice President for Information Services and University Librarian at Columbia. "We are grateful to the NSF for supporting a program that will have a powerful impact on teachers and learners." Subscribe to the VITAL Project's RSS updates.